When Meet the Press was first broadcast in 1947, the show's moderator and co-creator Martha Rountree launched the most enduring program in TV history. Martha Rountree was a broadcasting pioneer. 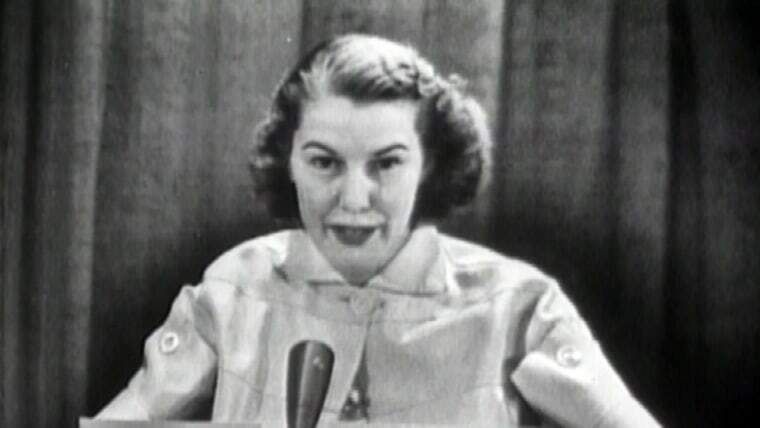 She co-created Meet the Press with Lawrence Spivak, sold the Mutual Broadcasting System on the idea, and was the moderator when the program began its Mutual radio run on October 5, 1945. At the same time, she was producing Mutual’s more lighthearted Leave It to the Girls, a Saturday evening program advertised as “a roundtable of romance featuring glamorous career girls” who discussed problems sent in by listeners, stimulating “a series of ad-lib crackers” (Time, July 29, 1946). Leave It to the Girls came out of Radio House, the New York production company set up in 1940 by Rountree and her sister Ann to supply musical commercials for radio stations. Leave It to the Girls was taken up by the NBC television network in April 1949. On December 2, Martha Rountree was the moderator when young Massachusetts Congressman John F. Kennedy made his first appearance on Meet the Press and spoke about the problems of defeating Communism in Indochina. Communists closer to home were the concern of Sen. Joseph McCarthy, who was her guest on August 7, 1951. One of Meet the Press’s most dramatic moments went unseen by viewers. Senator McCarthy was concerned about rumors that an armed member of the audience planned to shoot him if he revealed the names of Communists in the State Department, as he had threatened to do. He arrived in the studio and sat at the moderator’s table next to Martha Rountree. She was startled to see him take a gun from his briefcase and put it in his lap, where it stayed, unraised, throughout the show. Rountree was an enthusiastic and gifted moderator, “the most politically influential of capital hostesses,” according to LIFE magazine. “In Washington political circles an invitation to a Rountree party is practically a command,” LIFE said in a March 1952 photo feature—titled “Life Goes to a ‘Meet the Press’ Garden Party”—showing some of the 350 “movers and shakers of the U.S. political scene” at a Rountree housewarming party. They included four presidential candidates and congressional leaders Sam Rayburn and Joe Martin. Hamburgers and plain potato salad were served.